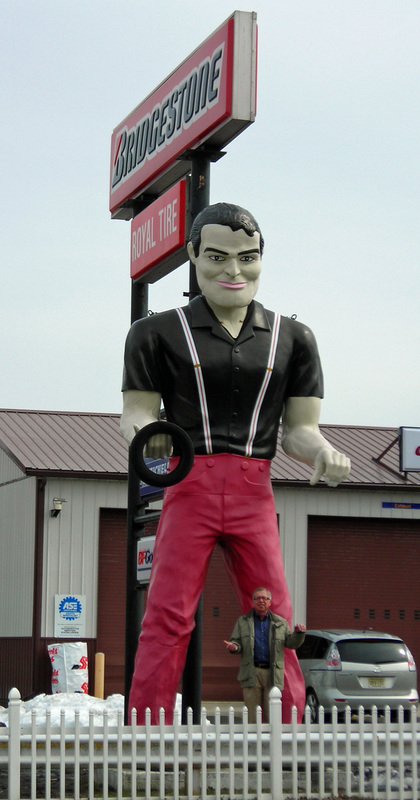 “New” New Jersey Muffler Man – The Home of My "Big Things"
I lived in South Jersey for 13 years and never saw this Muffler Man or was tipped to him by my vast network of Bird Dogs. I don’t know where he came from or how I could have missed him. We did get this photo last year when we were visiting Ben and Annie. First I thought it was a Muffler Man that was moved from down the White Horse Pike (US-30) from another tire dealer in Berlin, but it’s not. I wish I had gone into the shop and asked how long he’s been there, maybe I will next time I’m out there.